© 2009 Radiance House. All rights reserved. 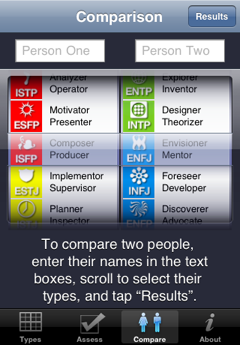 The MBTI Instrument is a registered trademark of the Myers-Briggs Type Indicator Trust. Improviser, Stabilizer, Theorist, and Catalyst are trademarks of Linda V. Berens, PhD. and are used with permission. The Sixteen Types model is compatible with several other personality frameworks, including Temperament Theory. Notice how the Types are grouped into four colors: red, yellow, green, and blue. Types with the same color share many needs, values, and talents. Similarly, there are four groups of Types (which are not color coded) that share the same interaction style — how they approach people, manage communication, and work on a team. 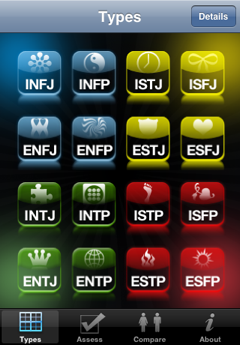 Within each color, or Temperament, there are four Types; each with a different interaction style. 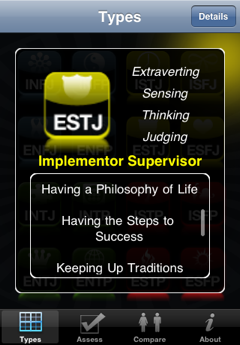 Taken together, there are sixteen Types; each with unique themes, strengths and challenge areas. 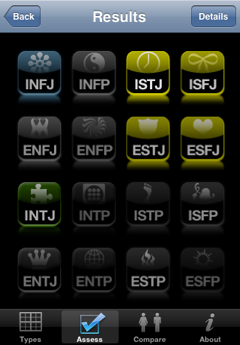 Click on one of the bars to the right to find out more about the Types belonging to that Temperament.